GRRRLS * can skate is a self-organized working group from Bielefeld supporting girls* and women* in skating, on the skateboards AND longboards. Since its establishment in 2014 they focus on women, lesbian, trans* inter in skating combining its theory and practice to encourage more women* to conquer the sport, become active, and to follow a passion, although the society says otherwise! With creating safe places, role models and giving them more visibility the GRRRLS* dedicate their work to break gender stereotypes. Last week they did an exposition in the old post office in the University of Bielefeld, showing their work of the past two years. 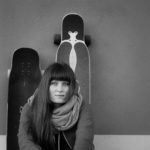 With the photos of the five photographer Anne Braune, Carolin Bollig, Marius Landwehr, Papa Grüneberg and Maria Arndt of various female skater and role models they intend to call more attention to women* in a male dominated sport. Many curious visitors and conversation made the exposition special in a very positive way but also showed the need of this work. The exposition is now shown in the youth center Walde in Bielefeld and is heading to the Beelen’s youth center next week.